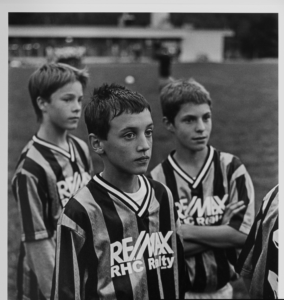 Set to coincide with the Nelson and District Credit Union’s 60th anniversary in 2010, this exhibit will feature photos taken by well known local photographer Fred Rosenberg, originally commissioned by the Credit Union and subsequently donated to our collection by the artist. Included in the adjacent display space will also be a selection of diverse and at times humorous artifacts from the Credit Union’s past, as well as interesting information about their history in the community. Printmaker and Painter Natasha Smith explores archetypal mark-making in a visual dialogue between mother and child. Smith developed a series of rune or hieroglyphs inspired by the drawings of her six year old son, Dylan. They form a visual language in the exhibition to share journey between mother and child that the artist calls a joined world. The work in the exhibition will be a series of collage drawings created on seven doors. The works are drawings in that they cover a breadth of media where mark-making is explored through collage, paint, embossed paper and cera colla. The door as a symbol invites the viewer to enter a limitless world of imagination. In her new body of paintings Consanguinity, artist Rachel Yoder intentionally limits the size of her paintings, uses only abstract shapes and ponders the idea of Consanguinity, or of something being too closely related to merge or marry. 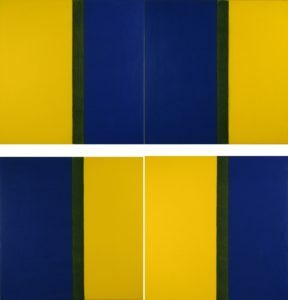 In this way, Yoder hopes to push her and the viewer’s understanding of colour perception. Of colour she says, colour perception is a mutable exercise. Colours can have one appearance when they are by themselves, another when they are placed with colours from the same part of the colour wheel and yet another… Taking for her inspiration the late German colour theorist and abstract painter Joseph Albers, Yoder set about to expand our visual and intellectual perceptions of colour. How sustainable is your beer? How is beer made? The History of Brewing in Nelson exhibit will provide visitors the opportunity to ponder these questions and more. From labels and bottles to beer trucks and parade floats, numerous images and artifacts will be on display both from the Touchstones Nelson permanent collection and on loan from private collectors. Additionally, this exhibit will feature not only information about the process brewing and samples of the ingredients, but there will also be a small batch of ale actually being brewed in the gallery! Although it was less of a choice in those days, many people practised localized consumption in 1894 when Robert Riesterer started brewing beer in Nelson. Over the decades, Riesterer’s brewery would change names and ownership several times, weathering two world wars and the “People’s Prohibition Association of Nelson” (circa 1916). It also acquired and merged with other small breweries over the years, its growth spurred on with the advent of a modern transportation system. 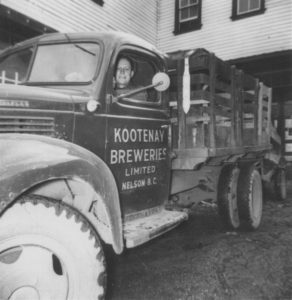 In 1959, nine years after being purchased by Interior Breweries Ltd., operations were moved to a newly constructed plant in Creston, leaving Nelson without a local brewer for the first time in decades. A generation later, with “microbreweries” gaining in popularity, enter the Nelson Brewing Company, unrelated except by name and its location in the building formerly occupied by Riesterer’s brewing company. Nearly two decades later, NBC continues to thrive primarily serving a local market, similar to brewers more than 100 years ago, an interesting echo of those earlier times. Today however, with ideas such as the “100 Mile Diet” gaining increasing public support, buying local is much more about choice than necessity. In 2005, NBC made the decision to make all of its beers certified organic, making it among the first commercial breweries in Canada to do so, and further reflecting the interests of the local market. Sustainable? Perhaps, but definitely tasty! Ah, if only we could jump in a time machine and taste some of the NBC brews next to the beers of yesterday…. ( note: there will not be a time machine in this exhibit). Local fibre artist Angelika Werth will exhibit a series of hand-sewn dresses which explore the idea of the dress as a shelter or dwelling. Her use of house wrap in the making of some of the dresses will be derivative of today’s building industry and her use of pioneer canvas tent material in others is evocative of the ethnic nature of temporary or season dwellings. Dress accessories and tent materials come about through Werth’s passion for rummaging in second hand stores, flea markets and auctions for the unexpected. A vital part of her creative process whether she is in Nelson or Paris. The dresses to be exhibited in Ladies in Tents are also inspired by the poetry of 16th century writer Christopher Marlowe. Lines of his poetry are embroidered into the dresses themselves. “The tent dresses are big enough that you could sleep under them,” says Werth. “I quite often think of the kilt, which used to be a bedroll at night and then was worn as a garment in the day.” Her clothing designs reflect long hours of hand felting, embroidery and beading, and many have a historical genesis. Long recognized for her exceptional skill level in contemporary craft, Werth received the BC Creative Achievement Award in 2008 and was chosen to be this year’s cultural Ambassador in the Arts for the city of Nelson. Werth started her career with a three-year dressmaking apprenticeship at Yves St. Laurent in Paris which culminated in a Master’s degree in dress design. She currently teaches in the Fibre Department at the Kootenay School of the Arts in Nelson and is a sought after teacher who teacher of dress making all over the Canadian West. Kristi Malakoff is an emerging Canadian visual artist who has participated in artist residency programs at the Banff Centre, the Stride Gallery, Calgary, SÍM, Reykjavík, Iceland and most recently Moscow, USSR. 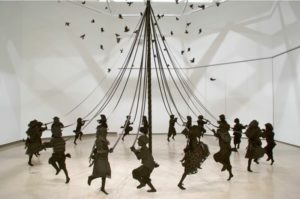 She has exhibited widely and rigorously in both group and solo shows throughout Canada and in England, the US, Germany and Mexico. She currently resides in Nelson, BC. The Golden Bell will consist of some of Malakoff’s previous pieces, such favourites as Resting Swarm an installation made of meticulously cut out photos of 20,000 life sized honey bees pinned into one large mass of bees. This work plays with the viewer’s sense of beauty and horror and was shown at the Art Gallery of Peterborough in 2008. 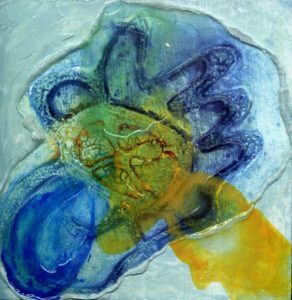 This work continues with her interest in paradox specifically with notions of life and death, beauty and the foreboding. Her imagery is inspired by her travels and observation of other cultures as well as her photographic work. Malakoff says the new work in The Golden Bell will explore the notion of transcendence, such as a church with a bell tower made from copies of 100 dollar bills. 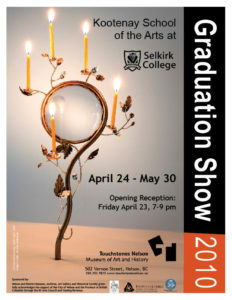 This exhibit features the work of graduating students from the Digital Arts and New Media program at Selkirk College. Student work in a variety of traditional and electronic media will be displayed. The program provides a two-year Diploma of in-depth training in the design, development and production of new media on the Tenth Street Campus in Nelson. Refuse Culture: Archaeology of Consumption uses multiple installations, and installations of multiples, to consider the remnants and debris of human activity littering the planet’s surface. 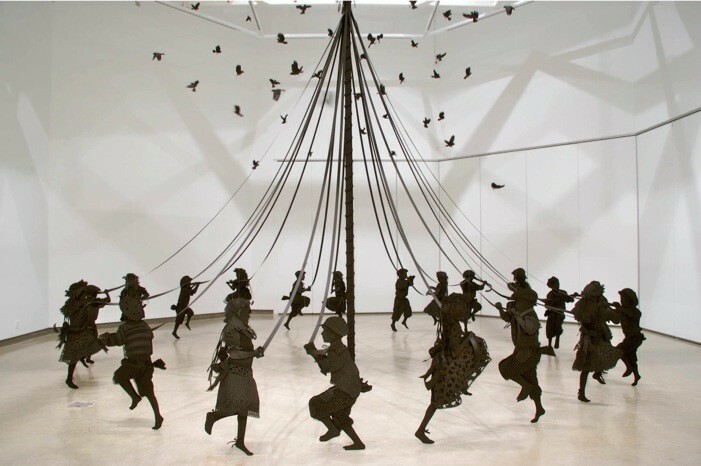 Each installation revolves around an object, or fragment of an object, taken from daily life. Cell phones, plastic bags, car bumper covers, compact fluorescent light bulbs; these everyday objects are seldom disposed of with the same degree of order, reverence or celebration with which they were created and acquired. By collecting these objects together, the works amplify a contemporary narrative of consumption. 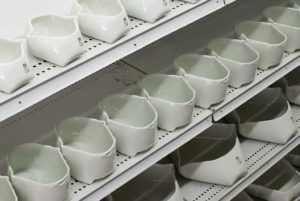 Cast in porcelain, the objects mimic the archaeological evidence left to us from preceding generations and ask the viewer to question how the future might interpret our culture through these collections of fragments. From the permanent collection of Touchstones Nelson comes an exhibit of watercolour paintings by the multi-talented Arthur Lakes (1844-1917), a notable geologist, artist, writer, teacher and minister. Originally from England, he moved to the West Kootenays in 1912 from Colorado to be with his two sons who were working as mining engineers. 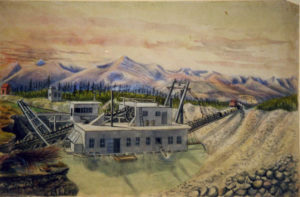 Lakes produced a number of paintings during this time, depicting some of what he saw in and around the mines and countryside. 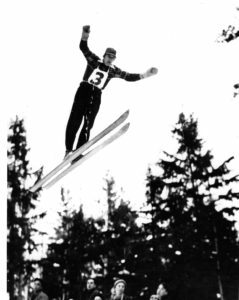 In celebration of the 2010 Winter Olympics in Whistler, Snow and Ice: History of Winter Sports in Nelson will highlight notable Nelson sports figures both past and present. 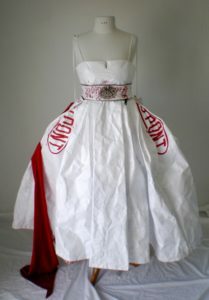 Additionally, the exhibit will showcase sports items such as an Olympic jacket worn by Nancy Green, both from the Museum’s collection, as well from private lenders. A playful look at Olympic Mascots will be an interactive display in the exhibition, where viewers can try their luck at matching the mascot with its respective country. Touchstones Nelson will also be serving as a “live site” during this time, providing a public venue where visitors can watch the Olympic coverage.